Enlightened are an experienced and professional performance equipment specialists company offering the best in equipment maintenance, training, and support for venues no matter their size or arts discipline. We have extensive experience and expertise in maintaining, testing and installing technical equipment across a wide range of venues including, large multi venue theatres, small arts spaces, schools, colleges, exhibition halls and houses of worship. Our qualified, skilled and dedicated staff can provide experienced support, service and training in lighting, audio, video, staging, rigging and all things technical in a theatre environment. As one of the leading performance equipment providers of, Hire, Installation and Production services in the South West we have extensive experience in servicing venues, events and productions of every kind. We know what it takes to keep your equipment in the very best shape however hard it works. We have repaired, installed and used equipment in a huge variety of venues and across performances as spectacular and diverse as you can imagine. We maintain, inspect and install equipment all day every day so we know your kit inside and out. If you would like to make a request for equipment / venue servicing or repair, please submit your request via the link below. 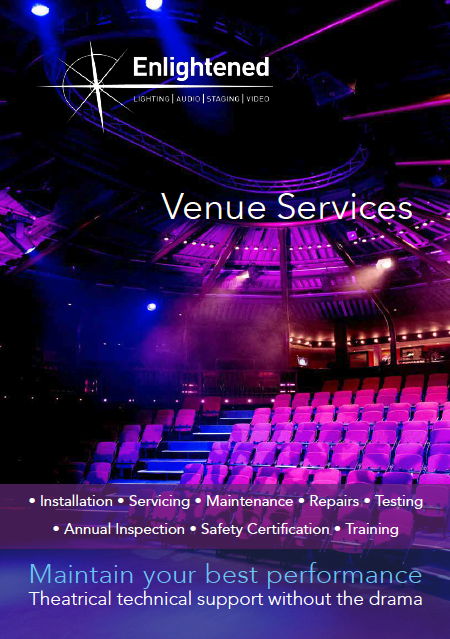 We can cover all your venues maintenance needs and regulatory testing requirements. Annual testing, inspection and certification. Onsite repairs, servicing and trouble shooting. Tailored, training and equipment instruction. Design, installation and commissioning of complete technical solutions. Fully accredited annual inspection, testing and safety certification. Lifting & Access Equipment Testing. Manufacturer qualified onsite service and maintenance. Moving and fixed light repair. Off site workshop component level repair. Onsite equipment support and venue specific training. Onsite client training; on an individual or group basis. Comprehensive equipment instruction and support. Out of hours technical help and support. Manufacturer training days at our premises or venue as required. All rigging accessories require inspection every 6months. Our qualified inspectors have years of experience to do this. Equipment often needs cleaning and maintaining to get the most out of it. From lantern cleaning to full moving head servicing. We can maintain it.